Citibank can be a great choice for business owners looking for a variety of bank account options that are tailored to their specific business needs. However, these options will only be available to businesses operating near Citibank branch locations. Citibank's CitiBusiness bank accounts can be a good choice for many businesses. Citibank has been providing businesses with reliable and competitive banking resources for more than 200 years. Their high interest rate savings accounts put them above some of their competitors, and their 34,000 ATMs and over 1,000 branches span across the majority of the United States. Citibank offers several ways for their customers to waive monthly fees, and even offers a unique checking account that allows for unlimited transactions and deposits by using earnings credit to waive fees. Unfortunately, Citibank only allows businesses to open a bank account at a physical branch, creating accessibility problems for some. Additionally, their CitiBusiness Preferred Banking doesn't offer nearly as many perks as their competitors’ rewards programs. Who is CitiBank right for? Citibank can be a great choice for business owners looking for a variety of bank account options that are tailored to their specific business needs. However, this option will only be available to businesses operating near Citibank branch locations. Citibank offers a variety of checking account options tailored to different business needs. With 34,000 ATMs and over 1,000 branches in the United States, customers can find Citibank just about anywhere. Monthly fees are easily waived if you keep a low minimum balance. Citibank has a well designed and user-friendly mobile app. Citibank offers good interest rates when compared to its competitors. While the online banking and personal banking sections of the Citibank website are easy to navigate, the business section is somewhat confusing and poorly organized. Since you can only open a business account in person, those who are not located near a physical branch location will need to travel or select another banking option. Citibank’s CitiBusiness Preferred Banking program falls short of its competitors in terms of included features. Citibank offers a variety of bank accounts to meet the needs of their clients. Their CitiBusiness bank accounts range in resources for small to large businesses. 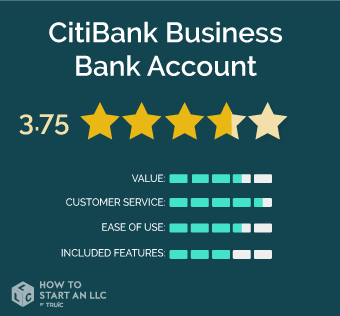 One unique account offering is the CitiBusiness Checking Account. This account differs from other banks’ offerings in that it does not include any free transactions or deposits. Instead, the account relies on earnings credit to waive fees. This means, the more you deposit and use the account, the easier it becomes to waive fees. Who should open a CitiBusiness Streamlined Checking account? If you’re running a small business that makes around 250 transactions per month, and you plan to keep a low balance, the CitiBusiness Streamlined Checking Account is a good option for you. Who should open a CitiBusiness Flexible Checking account? The CitiBusiness Flexible Checking Account is meant for growing businesses, giving space to those who make a high number of transactions and maintain large balances. A monthly earnings credit on your combined balance to waive all your monthly fees and limits. Unlimited transactions and currency deposits. Who should open a CitiBusiness Checking account? The CitiBusiness Checking Account is great for businesses that maintain large balances and can bring in enough earnings credit to waive fees. It’s designed for business who need limitless transactions and deposits. Who should open a CitiBusiness Interest Checking account? If you’re looking for an interest-bearing account, and will not need to make very many transactions, Citibank's CitiBusiness Interest Checking is a good choice for you. Who should open a CitiBusiness Savings Account? Businesses looking for a standard savings account with a low monthly fee can benefit from the CitiBusiness Savings Account. This account also offers an interest rate that is much higher than its competitors. Who should purchase the CitiBusiness Insured Money Market Account? With fairly high interest rates and unlimited deposits, the CitiBusiness Insured Money Market Account is a good choice for most businesses looking to put aside a large amount of money. Who should open a CitiBusiness Certificate of Deposit account? If you’re looking to make a short-term investment, the CitiBusiness Certificate of Deposit is a good choice. The interest rates are average, starting higher than Chase Bank’s and Bank of America’s short-term accounts. For long term investments, however, Citibank’s CD interest rates fall short compared to Chase Bank’s CD rates that go up to 1.05%. Who should purchase the CitiBusiness Preferred Banking account? If you want to keep a lot of your banking with Citibank, and want special pricing and benefits, then CitiBusiness Preferred Banking may be useful for you. Citibank offers a nice package, but it doesn’t have as many features and benefits as Bank of America’s Advantage Relationship Rewards Program. Citibank sets themselves apart with their savings accounts’ interest rates. Their interest rates start where some of their competitors like Chase Bank and Bank of America cap. Their Certificate of Deposit also offers competitive interest rates for shorter periods. Lastly, while their customer service is great, neither the business section of their website nor their CitiBusiness Preferred Banking program are very impressive. Writing this review required a great deal of communication with Citibank’s customer service. Their employees were knowledgeable and kind. Citibank offers phone, online chat, and mail services for their customer inquiries. Citibank’s premium feature program, CitiBusiness Preferred Banking, is the equivalent of Bank of America’s Business Advantage Relationship Rewards program. The Preferred Banking program provides a larger transaction limit, some free wire transfers, a high deposit limit, and more. But, compared to Bank of America’s Business Relationship Rewards program, Citibank’s Preferred Banking account is lacking in features and benefits. Citibank’s reliable and competitive resources make them a good choice if your business is located near one of their branches. They offer good savings account interest rates, and their CitiBusiness Checking Account may be useful for many larger businesses. In many ways, though, competitors like Bank of America and Chase Bank offer better account options and rewards programs. Citibank’s competitors also make it easier for businesses to open an account.